Whether you are an active collector of safes from bygone days, are thinking of purchasing one for your home or simply enjoy seeing the beauty of these functional antiques, most people agree that it is the high quality of workmanship that make antique safes true treasures from the past. It was not until the mid 1820s that safe production began in the United States. Prior to that time all safes were made in Europe. Basically, early European safes were strong wooden boxes secured with iron hoops. One of the first types of safes manufactured in the United States was the knob-chest, which later became known as the Hobnail Safe. First made in the late 1820s, workers constructed the safes from a wooden chests covered with pieces of sheet iron. They then banded, strapped and secured them with large headed cast iron nails giving it the hobnail look. Manufacturers of hobnail safes include Jesse Delano, C. J. Gayler and Magaud de Charf. Although they made the safes of the time to be burglar proof, people also wanted them to be fireproof. One of the first companies to patent a fireproof safe was the John Scott Safe Company of New York. In business for only two years, from 1834-1835, this company secured a patent in their first year to use asbestos as the fireproofing material. Recently the Elizabeth Street Gallery offered one of the few remaining safes by the John Scott Safe Company for a selling price of $8,500. The safes manufactured by the Diebold Safe Company earned their reputation as fireproof after the Great Chicago Fire of 1871. The contents of all 878 Diebold safes involved in the fire survived intact making Diebold one of the most desired safes of the times. 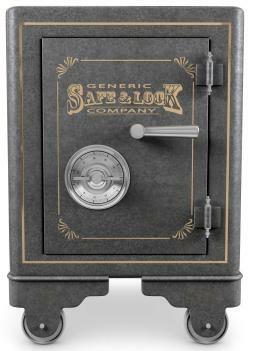 From elaborate Victorian standing parlor safes to massive commercial vaults, manufacturers of safes from years past produced safes in various sizes, shapes and designs. Massive Cannonball safes, named for their round shape, were often displayed in banks to show bank customers how their deposits were kept safe. Smaller versions of the cannonball safe were used in homes and businesses. Many models of restored safes, as well as those needing restoration, are found at antique shops and antique auctions both off and online. However, there are many styles that are very rare or hard to find. These safes are often part of large private collections or housed in museums. The following websites offer a chance to view several of these collections. The El Pomar Carriage Museum - scroll to the next to last row of pictures. Antique safes are a wonderful addition to any antique lover's home. They offer a place to store your valuables while providing a sense of mystery and intrigue as you imagine where your safe guarded treasures in earlier times.